Location: Washburn, North Dakota, At Ft. Mandan just west of Mandan. The Fort Mandan Nature & History Trail is located at the replica of Fort Mandan, Lewis & dark's wintering post of 1804-05, along the Missouri River, west of Washburn, ND. The loop trail is comprised of fly-ash and cement, mixed to form a natural-looking, yet hard surface to accommodate wheelchair traffic. 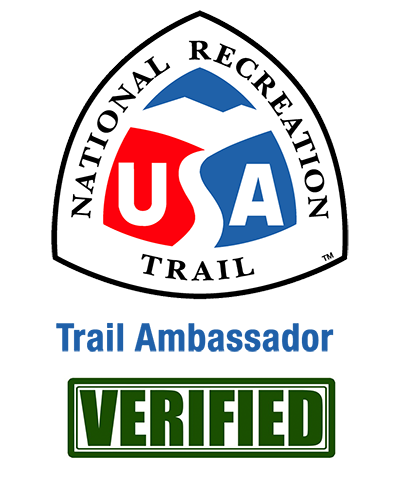 The trail takes walkers through the riparian forest of cottonwood trees, along the bank of the Missouri River. Filled with wildlife, including whitetail deer, pheasants, turkeys, Canada Geese and Bald Eagles nesting nearby, the Nature Trail provides a pristine environment for those enjoying it while they are visiting the Fort Mandan replica, which includes the Headwaters Fort Mandan Visitor Center and Fahlgren Park, with picnic shelters and playground area. 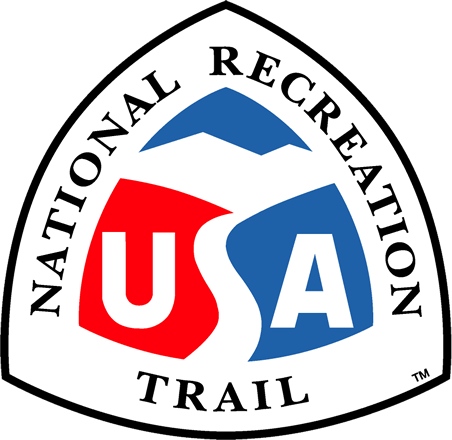 The Trail is a partnership between the Lewis & dark Fort Mandan Foundation and many donors who have made it possible, including members of the energy industry, National Guard and ND Parks and Recreation. 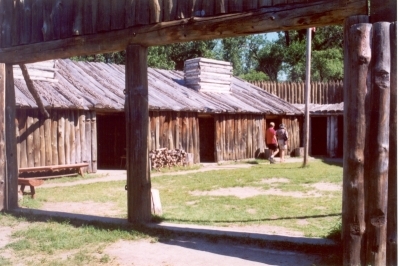 Reconstruction of Fort Mandan, Lewis & Clark Expedition, North Dakota. Photo by Chris Light/wiki. 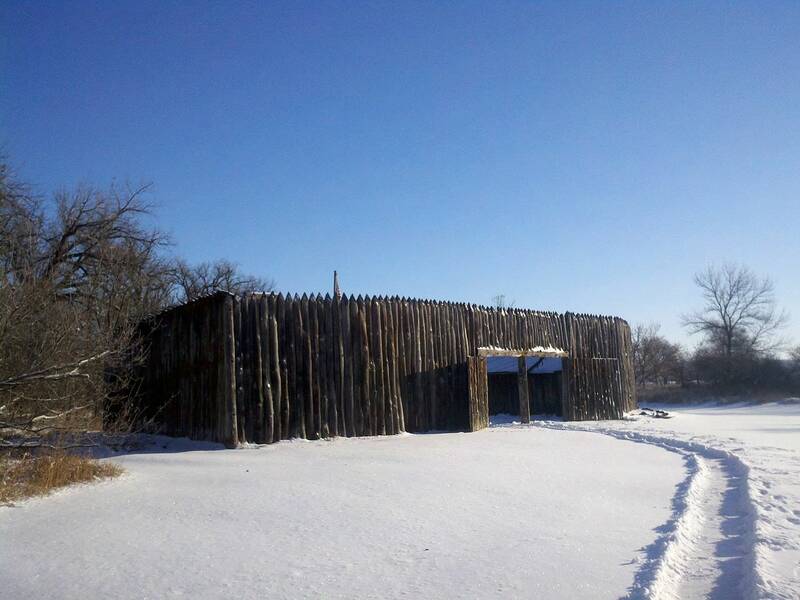 The reconstruction of Fort Mandan in winter. Photo by Gooseterrain2/wiki. 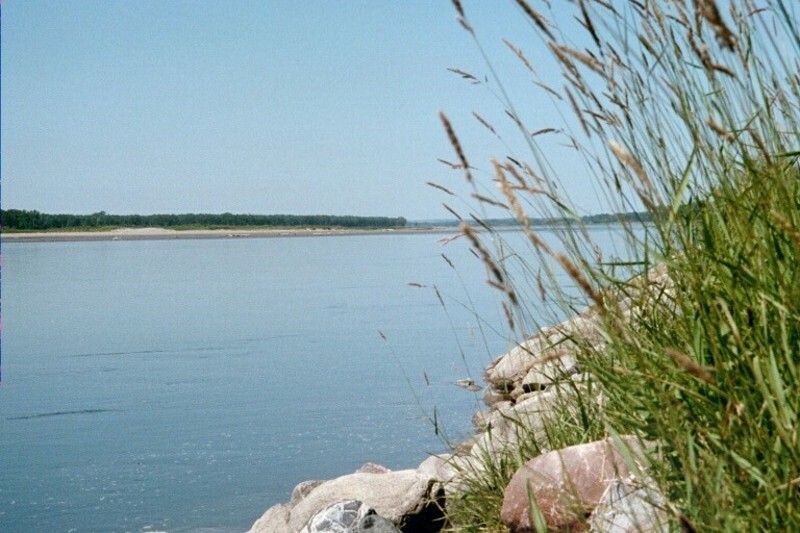 Missouri River passing the site of Fort Mandan, Washburn, ND. Photo by Chris Light/wiki. 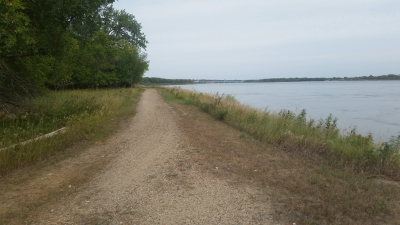 Trail next to river. Photo by Wendy Schmeichel.